The M27C256B is a 256 Kbit EPROM offered in the two ranges UV (ultra violet erase) and OTP (one time programmable). 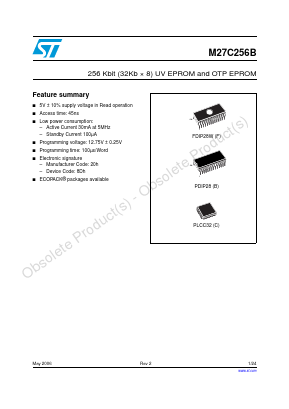 It is ideally suited for microprocessor systems and is organized as 32,768 by 8 bits. The FDIP28W (window ceramic frit-seal package) has a transparent lid which allows the user to expose the chip to ultraviolet light to erase the bit pattern. A new pattern can then be written to the device by following the programming procedure. For applications where the content is programmed only one time and erasure is not required, the M27C256B is offered in PDIP28 and PLCC32 packages. LButtonIn order to meet environmental requirements, ST offers the M27C256B in ECOPACK® packages. ECOPACK packages are Lead-free. The category of second Level Interconnect is marked on the package and on the inner box label, in compliance with JEDEC Standard JESD97. The maximum ratings related to soldering conditions are also marked on the inner box label. ECOPACK is an ST trademark. ECOPACK specifications are available at: www.st.com.